Dedusting is elementary component of the production process when processing high-risk acitve substances to e. g. solid pharmaceutical forms (pills, film-coated tablets, etc.). Because dust results unavoidably when the raw material is guided to a machine. 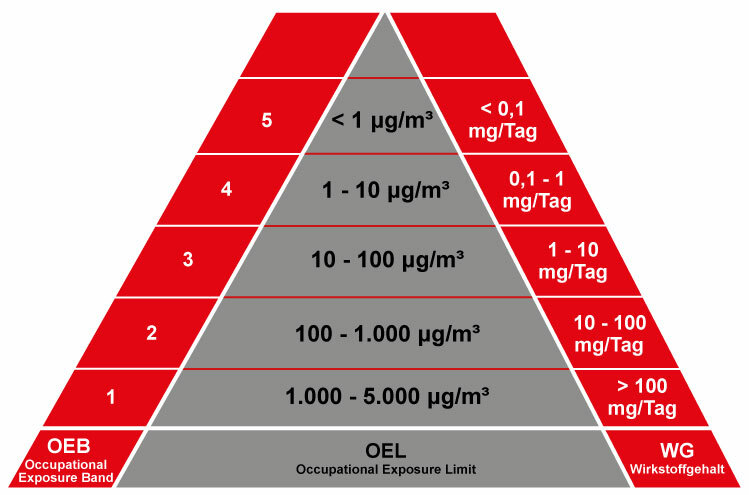 The suitability of a filter system for certain substances is among others depending on previously determined OEL values („Occupational Exposure Limit). These quantify the amount of substances per standard cubic metre per breathing air, which a human can be exposed over eight hours without harming his health. 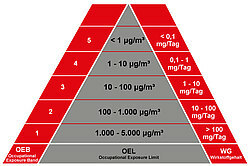 OEL-values are related to OEB-classes (Occupational Exposure Band). A substance with an OEL value of 3 µg/m³ corresponds to e. g. OEB 4. The filter system must comply with the different demands according to these classes. With OEB-classes 1-2, open / half-open systems are allowed, whereas OEB 3-5 systems require primary containment. Thus, usually a RABS containment system (Restricted Access Barrier System) is sufficient. Pharma production processe that are classified in OEB 5 need to be equipped with special highly efficient particulate matter filters. Parallel with protection of service staff, also the residual dust values of a filter system need to be considered, this means protection of environment. Also here apply adequate demands. Particualte matter filters are classified according to the European norm EN1822. The classification is achieved by categorisation in groups and filter classes. The efficiency of the filter system is expressed in separation grade and transmission level. HEPA filter and ULPA filter achieve an efficiency regarding MPPS with particle size from 0,1- 0,3 μm up to 99,999995 % (ULPA-class 17). With regard to the highly sensitive applications of filter units, secure systems for the change of filter cartridges or filter cassettes and the dust discharge must be carried free of contamination. 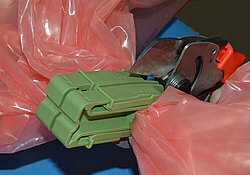 The-safe-change technology is often used for this purpose. Taking into account safety for staff and environment, this method complies with the highest demands when handling with dangerous substances. Particular attention needs to be given to the quality of plastic sacks and the sealing system. Specially when cutting off the safe-change sack, disallowed high dust loads can be released.